It's the night when table tennis legends are born—mostly in their own minds, but who cares? 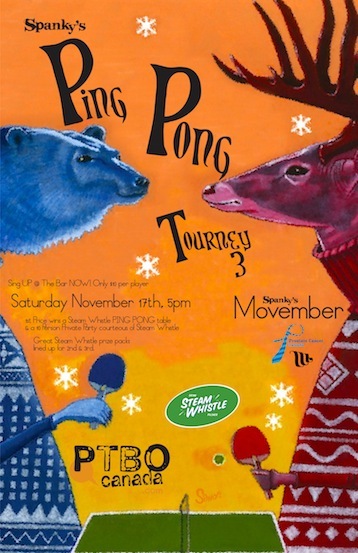 Sign up now at Spanky's for their 3rd Annual Ping Pong tournament happening November 17th, starting at 5 p.m. sharp. This fun night—there is sure to be a great rally or two—is also a fundraiser for Movember, so bring your Mo Bros along and fans to cheer you on. PTBOCanada is a proud sponsor—and participant again—this year.